Another year, another ExpoNG. And although the selection of layouts was maybe slightly lower in profile than 2008, in no way did the show disappoint. 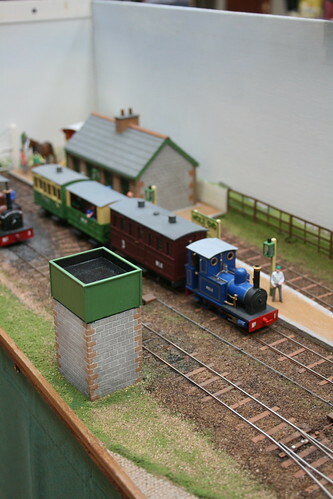 Something the photos never really capture is the social aspect, it’s one of the few opportunities of the year to catch up with narrow gauge modellers from across the country (and indeed the world!). Although the internet increasingly makes communication easier, there is nothing to beat actually discussing ideas and projects in such an environment and this year I really felt like I took away enough to keep the inspiration going until next time. 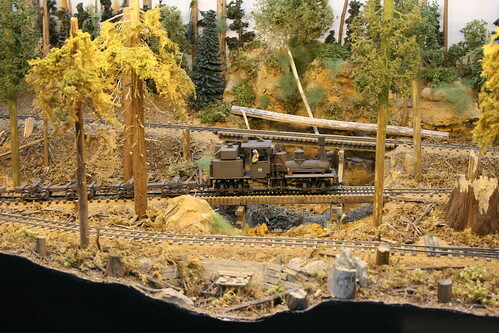 Willowdale Light Railway by Don Sibley. 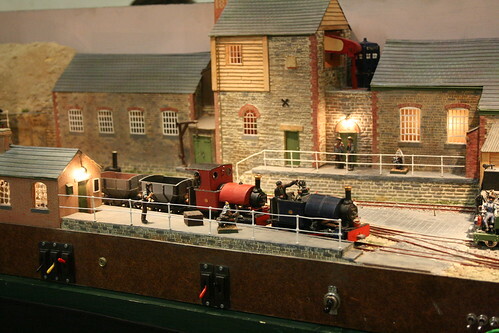 1:50 scale on 18.2mm gauge. As is often mentioned, when you’re building everything yourself the scale you choose is pretty much irrelevant. 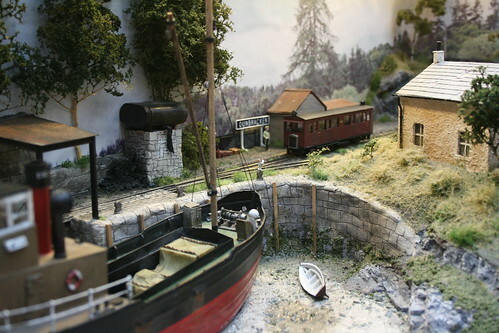 In 1:50 scale, “EM gauge” track at 18.2mm comes out at around 3′ gauge and this has given the charming Willowdale Light Railway something of the character of the Southwold where smaller stock doesn’t look out of place. The other great influence – and quite overt – is The Wind in the Willows which manifests in the loco and station names and also the appearances by Mr. Toad and friends. Whitsend Tramway by Graham and Caroline Watling. OO9. Whitsend is another of those OO9 layouts which I have seen a lot of in magazines over the last couple of years but never for myself. So it was a deight to finally catch up with it and see that photos don’t do it justice. The intensity of the detail in the long town scene is almost a visual overload, but it’s done so well that it becomes a pleasure to spend time taking it all in. And the trains run well too! Dunbracken by Tom Dauben. OO9. Tom’s ironing board-based layout attracted a lot of attention at the show, even before it was awarded the Reiner Hendriksen Trophy. It’s deceptively small, at only 4′ x 10″, but a great sample of his modelling abilty and a enticing taster for the larger layout he has planned. Calstock (Cotehele) by Chris Peacock. O16.5. 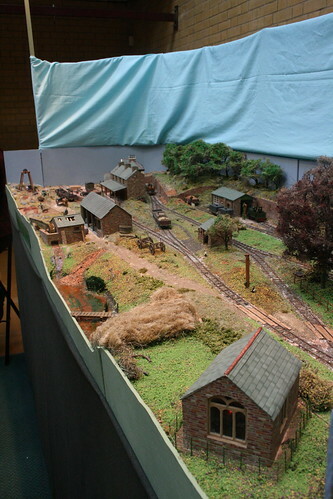 Chris’s Cornish layout won the David Lloyd Trophy, judged jointly by the OO9 Society, 7mm NGA and the G&DNGRS. 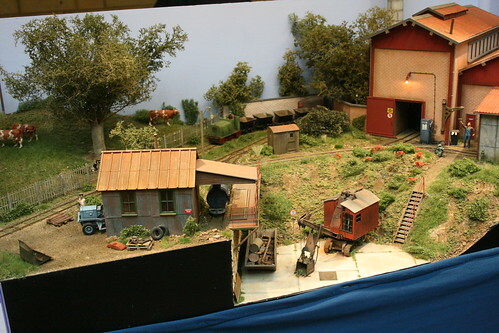 As you will discover from speaking to Chris while he is operating, the background to the industrial facilties is very well researched and the depth of the layout creates a busy yet spacious scene. 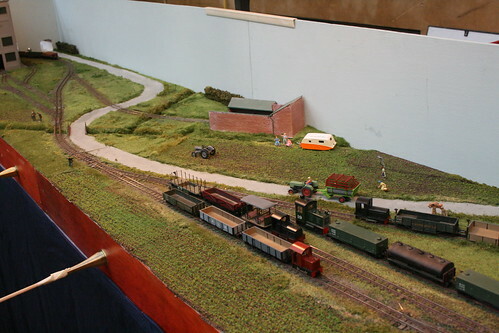 Holbeach Estates Railway by Stephen Sullivan. OO9. You often expect OO9 layouts mainly running small industrial locos to be small and industrial in themselves, however Holbeach is quite the opposite as it is inspired by the potato railways of Lincolnshire and portrays the vast, flat expanses of farmland they served. Get in close, though, and the detail on the tiny locos built by Stephen Sullivan is superb. Tan-y-Bwlch by Angus Watkins. OO9. Another illustration that you don’t have to pack a lot into an OO9 layout to get a lot out of it. Tan-y-Bwlch on the Ffestiniog was a remote spot pre-preservation and this is reflected in the size of the landscape around it. Viewed from the end on it almost doesn’t matter when there isn’t a train in view – it’s a great scene just on its own. St. Jean sur Mer by Peter Smith. G. When you get up to this sort of scale there isn’t really an excuse to leave out the scenic detail, and St Jean sur Mer has it wherever you look. It’s also up for sale, complete with the beautiful (and huge) locos and stock if you have a spare few thousands pounds and a large house. Dargil et Laitard by Groupe Escadrille St Michel. O14. The prolific Escardrile St Michel group seems to bring a different O14 layout to ExpoNG every year. This time it was Dargil et Laitard, a well observed small brickworks with a wealth of detail and a nice bassy sound system. As is typical of their work the finish on the locos and stock is excellent and there were several little cameos dotted around in the corners. 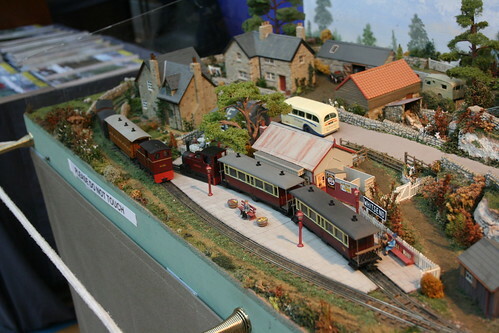 Blackwood Valley Railway by P-J Saunders. O16.5. An impressive layout from a young exhibitor, packed with life and detail. 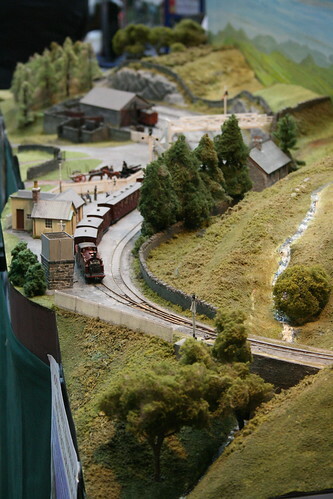 It’s based on his local area – the hills of Shropshire, the Glyn Valley and Snailbeach Railways. I’m looking forward to seeing what he comes up with next. There are more photos in the set on Flickr, but I’ll be going into more detail on some other aspects of the show later in the week. 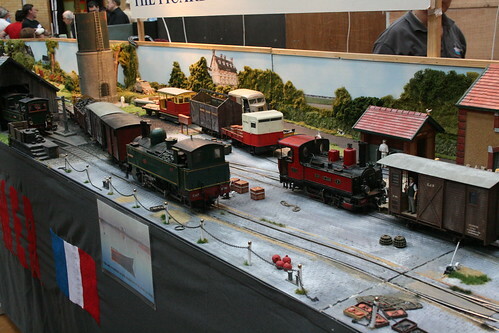 This entry was posted in 009, exhibition, expong, inspiration, model railways, narrow gauge, O14, O16.5, photos. Bookmark the permalink.